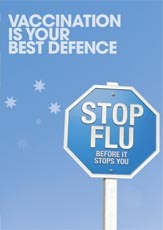 United Voice supports the QAS flu strategy and encourages all members to be vaccinated. For staff working outside of areas where these methods cannot be accessed there are a number of Pharmacy Clinics available or you can visit your local GP and be reimbursed by QAS for the cost of your vaccination. Check QAS portal for more information. • Stay at home if you have flu symptoms.